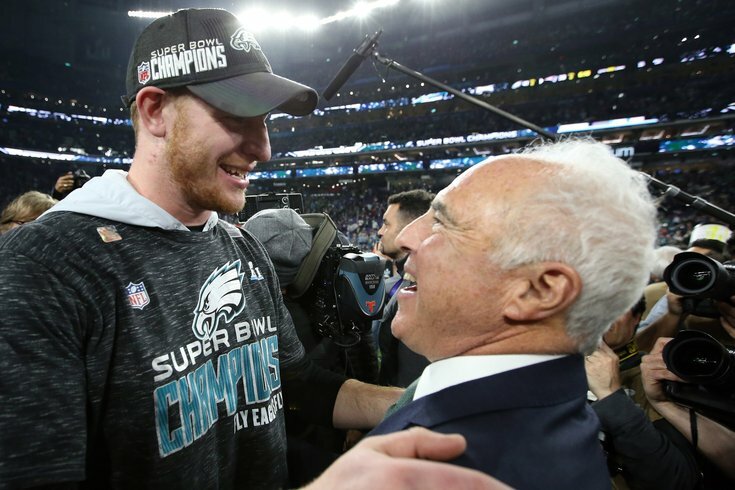 Philadelphia Eagles quarterback Carson Wentz hugs Philadelphia Eagles owner Jeffrey Lurie after defeating the New England Patriots in Super Bowl LII at U.S. Bank Stadium. It sure helped that they went out and won the whole damn Super Bowl, but this year's Eagles team would have been remembered for a long time even if they fell short. The NFC's No. 1 seed featured a colorful cast of characters with a genuine love for each other and their community, and it shined through on and off the field. They say you learn a lot about someone's character once they taste success, and if that's the case the Eagles only look better in the afterglow of a Super Bowl title. Wide receiver Torrey Smith, known just as much for his active social media presence as his contributions on the field this season, took to Twitter on Tuesday afternoon to share a heartwarming moment with a passionate young Eagles fan. Smith was visiting a local school on Tuesday when he came across a kid who was overwhelmed at the mere sight of one of his heroes. After striking up a conversation with him through some tears, the young man revealed Carson Wentz was his favorite player. And though we can't see him on Smith's cell phone, the child's face in this video says it all: he was able to talk to his hero thanks to some assistance from Smith. This kind of thing is awesome on so many levels, and the willingness from these guys to do something so small to make such a large impact is emblematic of why the team won in the first place. The Eagles toppled the NFL's greatest dynasty not because one guy put the team on his shoulders, but because small acts of sacrifice were made by every player and coach to get the job done. That includes all the injured guys like Wentz himself. In the days and weeks prior to the Super Bowl, Wentz and some of his other injured Eagles showed solidarity with the guys left to get the job done, and they routinely did their part to help get their replacements ready to go. Even when Wentz was the assumed backup in his first preseason, the Eagles raved about the strength of their "quarterback room" and the impact of having different guys working toward one goal. If you needed any more insight as to why Philadelphia sought out Doug Pederson as head coach in part because of "emotional intelligence," look no further than moments like these. The Eagles have a team full of guys who understand the gravity of what they say and do, and they carry themselves accordingly. Eagles fans had to wait a long time to see their team win the Super Bowl, but in the end, they were rewarded with a team they will always be proud to stand behind.